When tackling something as big as death, it’s sometimes easiest to make it into a single personality. Genre fiction is replete with capital-“D”-Deaths. Some are serious, some are funny, and some are just annoying. Here are ten great representatives from the great beyond. 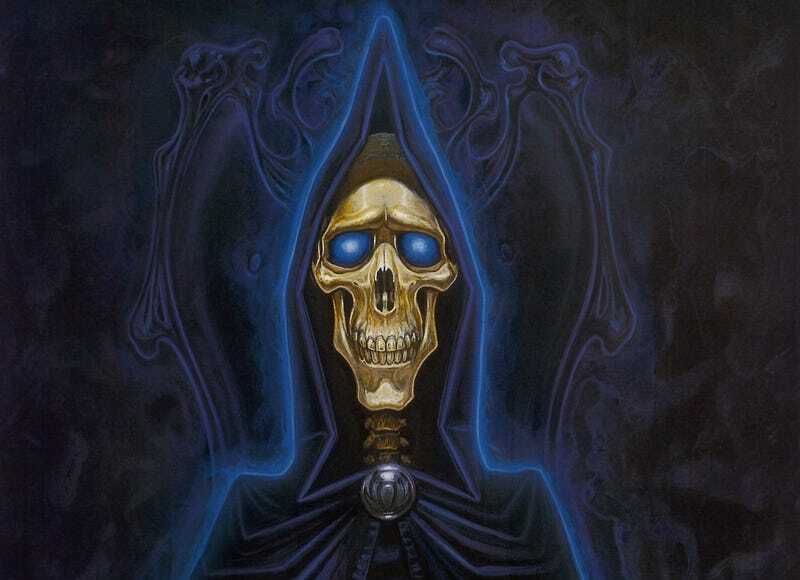 The Discworld version of Death looks like the stereotype: skull face, black robe, scythe, pale horse. Of course, his horse is named Binky. And this Death has a fondness for cats and seeing children get full, long lives. Terry Pratchett’s Death does his job, but he also has acquired an interest in humanity and their lives. Death TALKS LIKE THIS. Death is funny, quirky, and compassionate. He’s even a champion of humanity. There’s a reason that people have often wished that Pratchett was right about this one. Ingmar Bergman’s 1957 film is a classic for its depiction of a knight playing chess with death as a way to delay the inevitable. Even if you’ve never seen The Seventh Seal, you’ve probably seen a reference to it. If there’s a scene on a beach, in black and white, with Death and chess set, it’s meant to invoke The Seventh Seal. Hell, if someone challenges Death to a game, that’s a Seventh Seal reference. Outside of being capable of intimidating even the most powerful of creatures, Neil Gaiman’s version of Death eschews every other stereotype. Instead of a implacable male figure in robes, she’s a perky goth woman in casual clothing. As a kind personification of death, with a very distinctive look, it’s not surprising that she became so popular, so fast. Poor Death. This is the personification of the end of life, who loses to Bill and Ted. From the start, they escape him, beat him at Twister, and then has to do what they want. If anything ever proved that Death is the ultimate straight man, it’s this movie. From his very first appearance, it was clear that Death was not to be fucked with. Supernatural took the idea that this was a personification of a fact very seriously, creating a character who has been everywhere for all of time. He doesn’t care about people as much as he does making sure that nothing interferes with the natural order of things. Death has to take the very long view, and Supernatural got that. Death only shows up as a character in the story of the three brothers. The story is almost like Final Destination: Death shows up because he feels cheated that the three brothers don’t die. He offers them each a boon. Two brothers try to get something which will let them overpower Death, but they end up quickly dead. The brother who chooses to hide until he is ready ends up welcoming Death as a friend. Death acceptance is a major theme and so is the constant reminder that outwitting Death is not the way to go. Adventure Time’s Death is a horse skeleton who wears shades of white clothing, which is an interesting take on the Revelations 6:8 bit about Death riding a pale horse. (Although most of Death’s look is a reference to Alejandro Jodorowsky’s The Holy Mountain.) Like many of the new takes on Death, he’s not scary when he goes about his appointed rounds. Of course, he’s got a full arsenal of powers for those that bother him. Including making them play a musical battle for their lives. Which he wins, because Death always wins. What’s so great about Death in this sketch is that he is exactly the “scary” image that is expected. Ignorance and self-absorption turn this reaping into one of the most miserable of Death’s experience. Getting into the afterlife of Horrible Histories is pretty much contingent on amusing Death with an amusing story of death. The line is very long and you’d better have your story ready when Death yells “Next!” This version of Death is a sort of eccentric doorman. We’ve had droll Deaths and perky Deaths, but get ready for sarcastic and annoying Death! A Death who lives with his mom. A Death who sprains his ankle and has to outsource his job to the least competent person in the world. The most mundane Death in the world.